Marketing is essential for the success of any business, and mobile paint stripping and cleaning is no exception. Effective marketing is the single best way to get customers, grow your business, and make more money. As a Dustless Blasting® contractor, you are offering the best service in your industry. We already know what makes Dustless Blasting so great, but your customers may not realize it can be the solution to their problems too. Most people don’t know that there is a solution to their paint, rust, or cleaning problem. The guy who restores classic cars might think sanding for weeks or towing each car to a sandblaster to have it hopelessly warped are his only two options. You have got to get in front of him and show him there is a better way! The business owner with ignorant obscenities spray painted on the wall of his business might think all he can do is paint over it. If you tell him you can make it disappear like it was never there at all, he might be thrilled to throw his money at you. 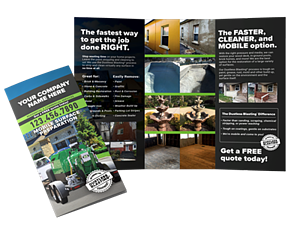 The Dustless Blasting® Marketing Package™ makes it easy to bring awareness to your new business, and is like a shortcut to success. When you're just getting started and have not done any blasting jobs yet, it's hard to demonstrate your services to potential customers. When you purchase our materials, you can take advantage of all the videos, pictures, and branding that are included. For example, if someone asks if you can strip their boat, just direct them to your personalized marine maintenance video, or hand them a marine services brochure — it's that easy! Nowadays, having an online presence is more important than ever. Just think about it...if you're looking for a good place to eat in a new city, what's the first thing you do? Google it! 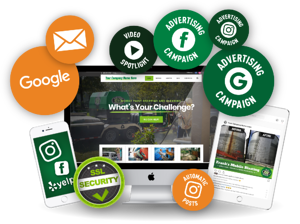 When you start your business with a customized online presence, our available ad campaigns and website optimization allow people to easily find you in search results. As the experts on surface preparation, we know the best ways to promote you to your potential customers. Let us help you start your business with a bang! Similar to a franchise, Dustless Blasting offers you powerful brand recognition. 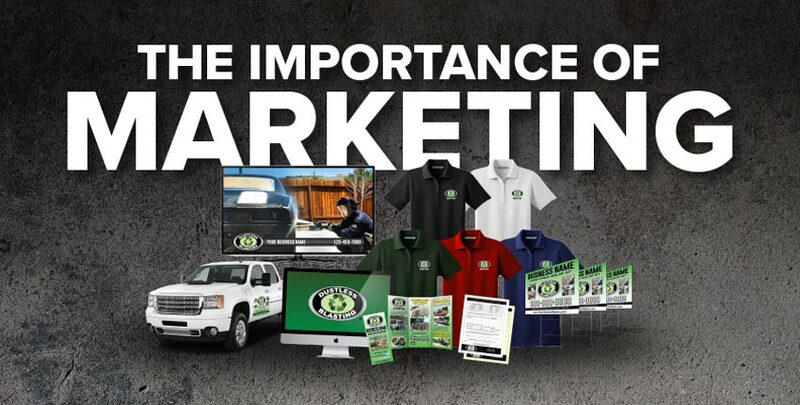 By purchasing a marketing package, you benefit from the millions of dollars we spend on advertising. When we make people familiar with the Dustless Blasting process, they are more likely to want that service. In turn, they become YOUR customers! But remember, it's not actually a franchise — you truly own your business. There are no ongoing fees, no corporate limitations, and no territories that you’re banned from. And of course, you get to keep 100% of the profit. Dustless Blasting truly is the best of both worlds for our contractors. Our Online Presence (Premium) package is the top of the line treatment for your new business. It includes ad campaigns that we create and run for you during your first 3 months of business. We'll also post social media content for you every week for a whole year, making sure your accounts are active and engaging for your customers. Finally, your Google Business Profile and Yelp profile make it easy for your satisfied customers to leave reviews. Don't be shy about asking them — good reviews build your credibility and are a great way to generate more business. 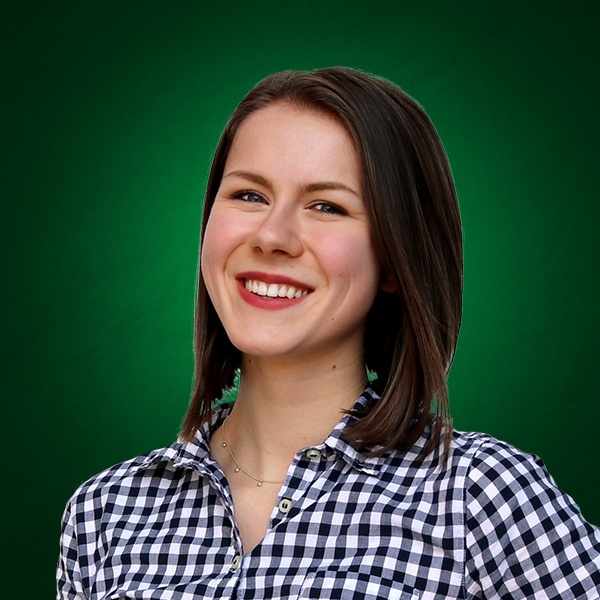 Want more tips and tricks on how to keep a steady flow of work coming in? Check out The Most Effective Ways to Market your Dustless Blasting Service. *Dustless Blasting® is a registered trademark of MMLJ and may not be used in your business name. Our business owners must abide by the Guidelines for Using MMLJ Trademarks and Copyrights, which will be published in the coming months.